NEB built Reichel-Pugh 74 IRC Mini-Maxi; WIZARD (ex BELLA MENTE) was the first monohull yacht to cross the finish line in Cabo St. Lucas, Mexico in the 2013 NHYC CABO Race. This bi-annual 800 mile dash down the Baja Coast found WIZARD facing intense competition from a well known group of west coast “So Cal sleds”. WIZARD is currently owned by the Unites States Merchant Marine Academy in Kings Point, NY. 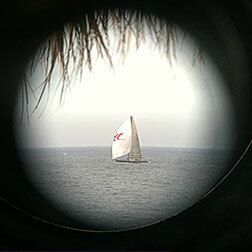 She is under charter for the Cabo Race by experienced ocean racers David and Peter Askew along with an impressive cast of characters with more than a few Cabo Races on their resume. New England Boatworks is very proud to see the ex BELLA MENTE adding another “first to finish” trophy to a growing list of awards since the yacht was launched at NEB in 2008. Since that time this well travelled yacht has won events in the Mediterranean, the US East Coast and the Pacific as well with a remarkable record performance in the last Transpacific Race from LA to Hawaii. After that event in 2011 original owner Hap Fauth commissioned NEB to build another IRC Mini-Maxi designed by Judel/Vrolijk. 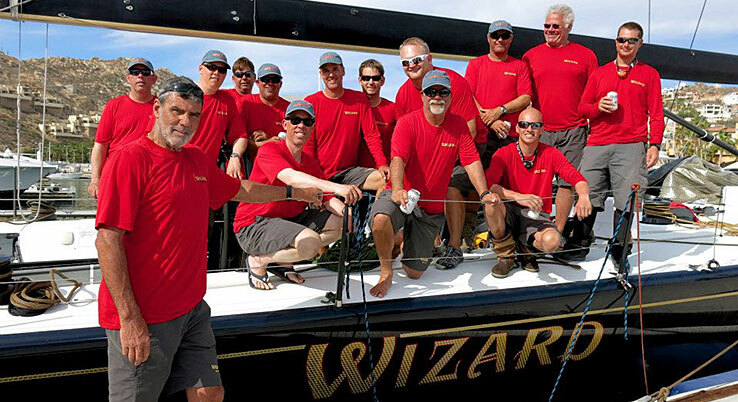 WIZARD was designed and built to fit IRC Mini maxi class rules. After several successful regattas early on the decision was made to modify the boat for longer offshore races where enhanced power reaching and downwind performance is a plus. Pictures below show the carbon-nomex transom scoop with custom fabricated titanium rails built by NEB and shipped to Florida. The hull mod’s along with a new NEB carbon bow prod and upsized spinnakers proved to add considerable improvement in downwind speed. This turbo version of the original design was trucked to LA for the 2011 Trans Pacific Race and went on to win line honors plus a new race record for elapsed time in the classic 2,225 mile race to Hawaii. Thinking about modifications, new foils or custom metalwork for your current boat? Contact NEB today to discuss how we can help improve speed and performance for racing or cruising.